Samsung shovels in the features (as usual) but at least the important ones are good... Very good. It's not cheap but it excels where it matters and that camera is outstanding. It's the best phone you can buy. Where to start with a Samsung Galaxy S phone launch? These phones aim to be the very best on the market and in recent years, they’ve arguably succeeded. But Samsung has always had a habit of hyping them through the roof and sending them to market laden with gimmicky features that can range from I-can’t-believe-they-invented-it to utterly terrible. And yet last year’s Samsung Galaxy S7 ended up being our Phone of the Year (once the price had dropped) and is still a great buy. 5.8in, 1440 x 2960 LCD screen, 64GB/4GB RAM, 2.35GHz Quad-core Snapdragon 835 CPU, Adreno 540 GPU, 12MP rear camera plus 8MP front camera, microSD (dual SIM slot on some models), USB-C, IP68 dust/waterproof, Iris scanner, Android 7, 3000mAh battery, 149 x 68 x 8mm, 155g. Full specs here. We’ve poured scorn onto Samsung’s curved phone screens many times before. For years gushing commentators have drunk the Kool-Aid and raved about them while simultaneously acknowledging that they make the most basic phone tasks (like typing and scrolling) a pain in the posterior to perform (here's why). This year both the S8 and larger S8+ have slightly-curved, bezel-less front screens which made us think we'd have to perform the review in a case. But we needn’t have worried. While there were some instances of our peripheral fingers interfering with phone operations, it wasn’t enough to be regularly annoying. Still, if you have Jimi Hendrix-like fingers, a case is probably a good idea. The whole phone is ensconced in Corning’s top-end Gorilla Glass 5 and, unlike the slippery-as-heck Galaxy Note 7, is actually quite impressive at sticking to your hand – even in wet environments like a steam room... yes, we tried. It sure looks pretty, but even Gorilla Glass cracks and we, once again, recommend using a case. The 5.8-inch AMOLED screen is as bright and colourful as we hoped (it’s also sunglasses proof – you can look at it in either orientation while wearing sunnies). The unusual Ultra High Definition resolution of 1,440 x 2,960 reflects the newer 18:9 screen ratio that we first saw on the LG G6. Having used both of these phones for some weeks, we can attest that going back to the old-school “fat” 16:9 ratio phones like the Google Pixel XL and HTC U Ultra just feels weird now – why would anyone want a phone they can’t easily fit their hand around? These longer-and-thinner form factor phones are far more comfortable to hold, easier to operate and they don’t feel like the screen is smaller at all. The screen only curves slightly at the sides (unlike previous models) which creates an interesting effect that wasn’t annoying, even when watching movies (with their distorted edges). Consequently, unlike previous Samsungs, there’s no dedicated 'Edge' apps to make use of the curves of the screen (there’s no room) but there is still a Samsung "Apps Edge" slide-out app which provides a shortcut to your favourite apps. We found that trying to get this slider to reliably appear was a bit more effort than simply pressing the main button to bring up the home screen, though. The long 18:9 screen means that it can easily be split into multiple Windows. Meanwhile a long-press on the icons brings up a context menu. The whole operating environment apes a stock Android operating environment. 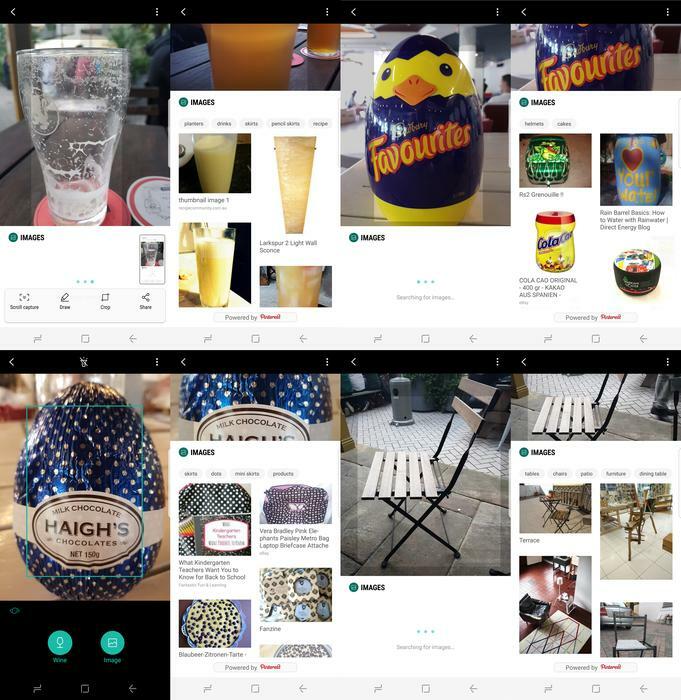 You can swipe left and right across your main screens or up to reveal the app-drawer with everything laid out in a customiseable way. As with the Pixel XL, there are some potentially-useful context menus that appear when you long-press an icon. In terms of performance, there are some minor differences between US and European specs. The US model gets Qualcomm’s brand new 2.35GHz octa-core Snapdragon 835 processor with Adreno 540 GPU for games. The European spec (which Australia gets) uses Samsung’s interpretation of the same thing: a 2.3GHz octa-core Exynos 8895 processor plus Mali-G71 MP20 GPU. Some people will rave over benchmarks. After testing every phone on the market we can vouchsafe that there’s nothing faster than this phone. All software execution is as instant as you could expect. Top drawer stuff. There's only one main speaker at the bottom but it was actually quite impressive. Conference calls were crisp and clear and music actually felt like it had some depth to it - treble didn't wash out and there was a slight punch to the bass. It all gets reasonably loud but not as much as speaker-laden rivals. Next to this is a proper 3.5mm headphone jack... it's ridiculous that we have to mention that these days. The headline feature here is the Iris Scanner. This was a gimmick with the ill-fated Note 7 – the response time and lag was horrendous. However, it’s very usable now and became our favoured way of unlocking the phone. Sure, staring at your own haggard brow several times a day won’t be fun for anyone outside the selfie generation, but simply staring at your phone to unlock things is a welcome feature. Samsung also provides some virtual masks to disguise yourself while your eyes get scanned. The fingerprint button is more of an issue, though. Firstly, it’s positioned awkwardly right next to the camera lens so you’ll regularly be sullying that by accident. It’s also a bit awkward to reach with your finger and you’ll find yourself unnaturally stretching to activate it. Once you have reached it, it doesn’t always work straight away. After getting used to the speed of the Oppo R9s' and R9s Plus' fingerprint readers recently, we have little tolerance for any delay here, but the Samsung’s reader only worked quickly on most occasions. Sometimes it just gave up and demanded we use a different unlocking method. This was annoying and will likely become even more annoying when making use of future Samsung Pay features. You can also unlock the phone with face recognition (which is the quickest and most reliable method) but this didn’t work in the dark. Beyond that there’s the usual Android pattern unlock and code unlock. Frankly we missed the reliable knock code of the LG G6 a bit. However, with a plethora of unlock options on hand it usually meant that any annoyance with unlock speeds was short-lived. It wouldn’t be a Samsung phone if it wasn’t laden with ridiculous half-baked features-and-claims and this is a Samsung phone in every sense of that description. First off, the good stuff. The Knox security – which is now simply called Secure Folder – is still present meaning that you can install private apps, messaging services and nudie pictures all in one secure area where the kids, friends and family won’t accidentally see them. There’s also the under-advertised Send SOS Messages feature which will send an audio clip, photo and your location to your selected contacts if you press the power button quickly three times. Samsung Pay – where you can use your phone to tap and go in stores – looks like it will grow legs. It wasn’t operating on our test S8 for pre-launch reasons however, we recently experienced it with the lesser Samsung Galaxy A5. It will happily copy your bar-code-based loyalty cards and free up some room in your wallet but where it’s only been operational with AmEx and Citibank cards (in Australia) it will now work with Westpac cards too. Hopefully the fingerprint reader won’t make this a chore. The updated Game Tools feature is potentially useful. This set of apps can lock the screen to avoid accidentally launching other things as well as take screen shots, record gameplay and block alerts while you’re playing. Game Tools is easier to access and use on the S8. The Palm Wipe for screenshot finally seems to work more often than not, but you can still do this by pressing the power button and volume-down. The power saving modes are also useful but we’ll cover those more in Battery Life, below. The Samsung Galaxy S2 is arguably what made Samsung the premium brand that it is today – it was the first modern smartphone that was generally considered to be better than the iPhone. Then the S3, S4 and S5 all appeared and they resembled the S2 with increasing amounts of Samsung-branded bloatware dragging everything down. Thankfully, that is far less of an issue now – many of Samsung’s “special” features are separate, elective downloads these days. But there’s still some pointless stuff here. 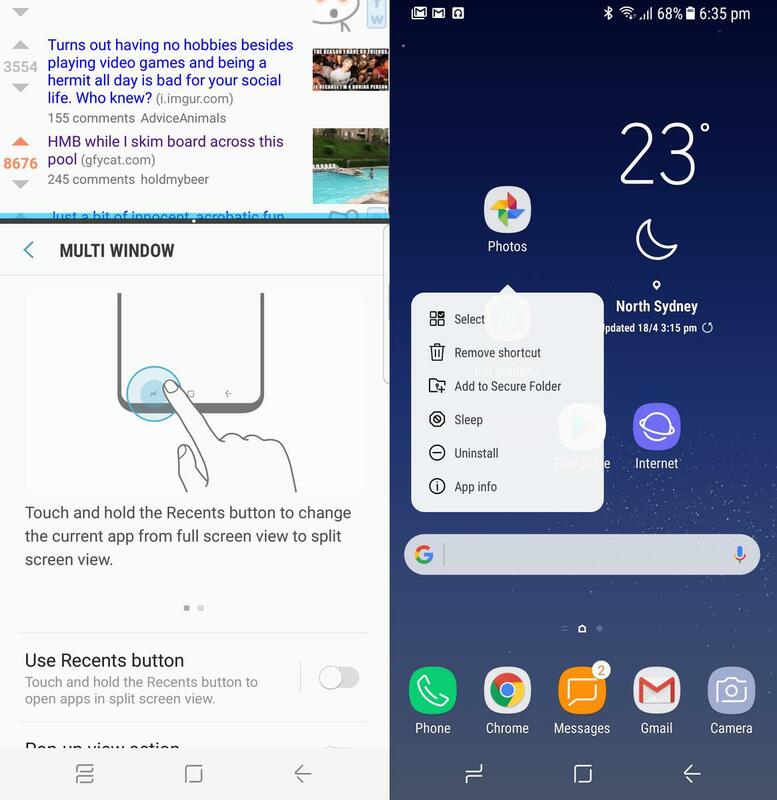 While other phone makers have given up on separate web browsers in order to use Google’s own Chrome, Samsung still persists with its own internet browser which can be synced with Samsung’s own cloud account. It will open all weblinks by default until you tell it not to. Other minor fails revolve around using the fingerprint readers as a heart-rate monitor... they kept telling us we'd flatlined. Great. One of the biggest features – according to Samsung – of the Samsung Galaxy S8 is Samsung’s new virtual assistant, Bixby. Early commentators were gushing about this but we had our concerns – as anyone who had suffered through Samsung’s abortive previous voice recognition attempts with S-Voice and S-Drive would naturally do. Firstly, the voice recognition won’t be working at launch because it’s not ready. There will be an even longer delay in Australia while Samsung tries to decipher what the bloody hell we’re all saying, eh? But we’re not holding our breath. The most intrusive/annoying feature of Bixby is Bixby Vision. This is where you take a picture and Bixby Vision nags you by wanting to analyse what’s in it. It’s total crap. If anything it’s entertaining to use just so you can laugh at how badly it fails. Seeing how terrible Bixby Vision is can be a fun game. Although it did once correctly identify a chair. Yay. The rest of Bixby is basically a second-rate clone of Google Now – screens that give you “helpful” information about your day and current location. It hasn’t all been working properly pre-launch but again... we’re not holding our breath. This is Google’s bread and butter and thankfully the excellent Google Assistant is already up and running on this phone plus it’s easy to turn most of Bixby off. Bixby Voice isn't even working yet. All it is is a second-rate Google Now. Unfortunately, though, Samsung has seen fit to add a special Bixby button below the volume rocker meaning you’ll hit it and launch the waste-of-space by accident on many occasions. We’ve been told that this button will be re-programmable down the line. The sooner the better.